Before meeting the star-faced crocodile of the title, we are introduced to a bear with a banjo sitting beside a lake, singing to the stars. The crocodile loves the song; he swishes his tail to the music and the bear sees his eyes just above the surface of the water, piercing the centre of the reflection of a star. The bear is astounded to see what he presumes is a star-faced crocodile, and every night when he sings, he tries persuade the crocodile to dance. The crocodile, however, knows that if he comes out of the lake he will no longer be star faced and will not impress the bear. Being a rather imaginative creature, the crocodile makes a hat out of star-shaped flowers, but the petals drop out one by one as he dances. The crocodile slithers back into the water, ashamed. When the bear asks the trees to fetch a star from the sky for him, they bring all the stars down but are so delighted by them they decide to hold on to them for themselves on a string. The crocodile manages to pull the string of stars away and plunge to the bottom of the lake. The moon is afraid of being captured too and hides behind a cloud, making the world very dark. When the crocodile emerges from the lake with the string of stars wound around him, nobody admires him because the stars are no longer shining. The night has lost its twinkling sky, and the music and dancing have stopped too. The crocodile, the bear and the trees realise that they must put the stars back where they belong, and when they eventually complete their task the stars shine again and the moon comes out. Music and dancing fill the air once more, and then suddenly a shooting star falls into the lake, just beside the crocodile, who really does look like a star-faced creature again. 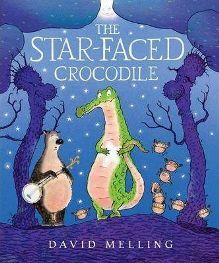 The inspiration for ‘The Star-Faced Crocodile’ actually came when David Melling was visiting his daughter’s school and one of the children suggested a star-faced crocodile as a character for a story. Melling has certainly developed the idea into a delightful tale, where the bear doesn’t mind if the crocodile is really just a plain ordinary one and just wants him to be his friend. As for the trees, they are helpful in some situations, but they have their selfish moments too when they are dazzled by the twinkling stars they have plucked from the sky. The text of the story is set in a clear, good-sized font and is mainly on a white background. On just one page it is a pale mauve colour on a very dark ground, and on a couple of pages the background is orange. There are two sentences at the beginning of the story that are completely in capitals. On the whole there is just a paragraph of text per double page, sometimes less. This is a book that is ideal for reading aloud to a young child, but it could also be suitable for a young independent reader as the amount of text is not off-putting. The vocabulary, whilst being varied, should not pose too many problems either. The writing style goes from being quite poetic when recounting how ‘A shy crocodile, drifting by, had never heard such a beautiful song’ to the much more down-to-earth ‘Oh flip!’ exclamation when the crocodile loses his star-flower hat. Melling illustrates his picture books himself and here he combines imagination and humour to create a visual feast. The watercolours, whether in a woodland or under-water scene, have a translucency as well as a richness of colour. Aside from the two main characters, we see caricatured trees with knobbly noses and spindly arms or tiny birds hopping and jumping around the bear’s feet. Once or twice a double-page spread entails turning the book sideways so that we can see the crocodile swimming right down to the depths of the lake, or the crocodile and the bear standing at the tops of the trees as they fix the stars back up in the sky. When I came across ‘The Star-Faced Crocodile‘ I had high expectations and was not disappointed. David Melling’s other picture books, such as ‘The Kiss that Missed’, ‘The Ghost Library’ and ‘Good Knight, Sleep Tight’ have proved to be very popular as read-aloud books for three-to-four-year-olds, as well as providing inspiration for drama sessions. My only reservation with ‘The Star-Faced Crocodile‘ is that one or two of the illustrations are rather dark and those with the trees might just scare very young children. On the whole, however, the pictures are full of humour that children will delight in. This is a book that is full of fun and ideas about friendship against a background of music, dancing and starry nights. Enjoy it with your children. No Comments on "The Star-Faced Crocodile"